First we need to know about the destructor of the class: the destructor is the member function that is used to destroy the memory of the object, when it is goes out of scope. That means the heap memory allocated by the member variables of the class can gets cleanup in the destructor of the class. The order of execution of the destructors are in the below fashion. 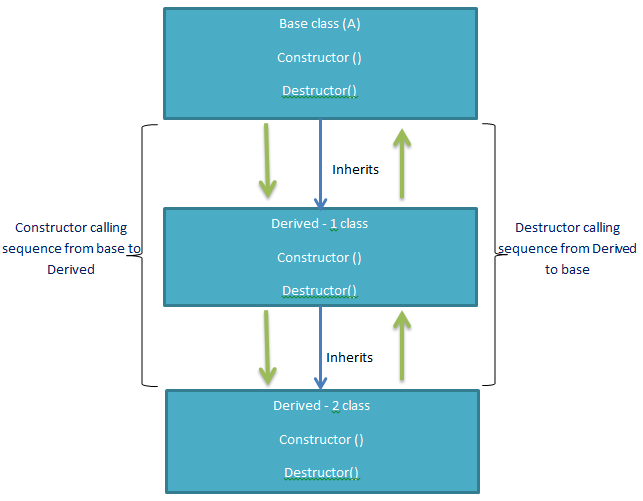 First the derived class memory gets cleaned and then the base class destructor gets called and deletes the base class objects memory. The order of execution of destructor in an inherited class during a cleanup is like this. The difference between a destructor and other member functions is that, if a regular member function has a body at the derived class, only the version at Derived class gets executed. Whereas in case of destructors, both derived as well as base class versions get executed.